St. Martin's Griffin, 9780312377625, 592pp. 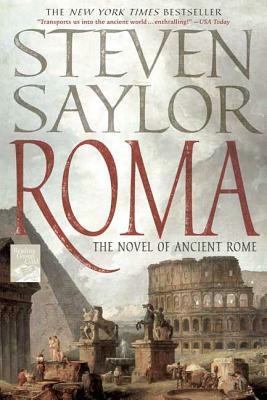 Weaving history, legend, and new archaeological discoveries into a spellbinding narrative, critically acclaimed novelist Steven Saylor gives new life to the drama of the city's first thousand years — from the founding of the city by the ill-fated twins Romulus and Remus, through Rome's astonishing ascent to become the capitol of the most powerful empire in history. Roma recounts the tragedy of the hero-traitor Coriolanus, the capture of the city by the Gauls, the invasion of Hannibal, the bitter political struggles of the patricians and plebeians, and the ultimate death of Rome's republic with the triumph, and assassination, of Julius Caesar. mysterious talisman as ancient as the city itself. Epic in every sense of the word, Roma is a panoramic historical saga and Saylor's finest achievement to date.